Victoria, Mahe (Seychelles) – March 28, 2017 (travelindex.com) – Bernard A. Metzger, the Founder & Director of the highly respected Travelindex Media has come out with a strong letter of endorsement for Alain St.Ange, the Seychelles Candidate for the position of Secretary General of the United Nations World Tourism Organisation (UNWTO). 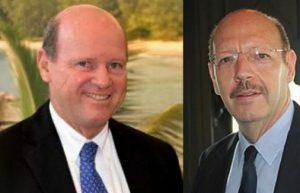 Alain St.Ange from the Seychelles is one of the seven candidates contesting the May elections to head the UN Tourism Body. Armenia, Brazil, Columbia, Georgia, Korea, Seychelles and Zimbabwe are the countries that are in the running with candidates already accepted by the UNWTO Madrid Office. In his letter Bernard A. Metzger, the Founder & Director of Travelindex Media says:- “I am following the process of selecting the next World Tourism Organisation Secretary-General and, as you well know, I am one of your greatest supporter and admirer and few in your position have achieved so much for world tourism. I humbly have the following recommendation to make which I’m doing on my own accord and based on my very personal opinion. As Founder of Travelindex, one of the world’s largest travel content distribution and destination marketing platform, connecting directly over 800,000 travel companies in 241 countries and territories worldwide, I declare herewith my support for the Seychelles bid for the post of Secretary General of the United Nations World Tourism Organisation (UNWTO) and stand behind Alain St.Ange without hesitation. I have seen Mr St.Ange as Head of the Seychelles Tourism Board and then as Minister and his enthusiasm and passion for tourism has never been greater. His success is a tribute to his hard work. I can think of no better person to become Secretary General of the UNWTO; Alain St.Ange is charged with an infectious energy and excitement over the future in world tourism. He places people and culture at the very heart of tourism and his fundamental belief is that tourism must be good for everyone, it must benefit every country and all people in the world. Mr. St. Ange said “The world must come together. We must connect and need to embrace each others’ ideas.” A statement perfectly aligned with our own slogan “Connecting Travel People” and our vision of making the world a better place by enabling universal and equitable access to data and information. Without reservation, I support and recommend Mr. Alain St.Ange for the post of UNWTO Secretary-General as I know that he is dedicated, hardworking and truly devoted to make world tourism work for everybody and a force for good”. Travelindex is a PATA Preferred Partner from Kong Kong and speaks to the tourism trade at large. As a known and respected tourism partner, Mr Bernard A. Metzger has now started communicating to UNWTO Member States to make his choice of candidates for Secretary General of the UNWTO known.